Over the past few years, Dubrovnik has definitely become one of the top cities to visit in Europe. It’s incredibly beautiful and is heavily featured in the HBO hit series Game of Thrones as the capital city of Westeros, King’s Landing. With all of this, Dubrovnik is a little on the pricier side, especially compared to other cities in Croatia. 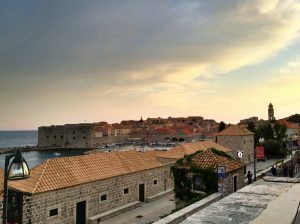 However, a trip to Dubrovnik is totally worth it because of its well-preserved old town, yummy food, and wonderful views. During peak season, remember that Dubrovnik is going to be busy, especially in the Old Town. It is a very popular destination, especially with Game of Thrones fans flocking there for filming location tours. The Old Town itself is all within the old city walls, which makes it incredibly beautiful but also a little hectic. At times, all the tourists can be overwhelming. 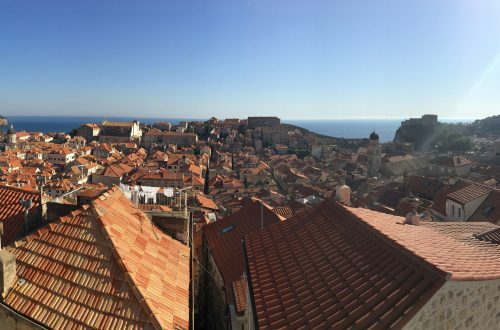 However, Old Town Dubrovnik is still worth checking out. Our first night in Dubrovnik, we stayed out of Old Town and up the side of the mountain. 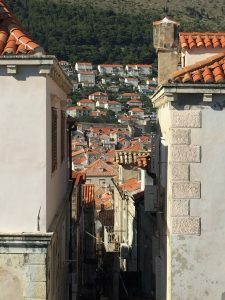 Dubrovnik is basically a mountain that meets the sea with a town somehow fitting in-between, so be prepared to walk some stairs. The hostel (Villa Banana) was nice, but pretty average. It was a lot cheaper than staying in Old Town and was also quite a hike to get back there. We only stayed there a night because we decided to take a one-day trip to Mostar, Bosnia and Herzegovina, which was our primary reason behind choosing this hostel for just the one night. We highly recommend the overnight trip to Mostar from Dubrovnik. It’s a 4 hour bus ride each way to Mostar from Dubrovnik, so while it isn’t the quickest, it is definitely worth it. Croatia is beautiful, so if you’re just focused on staying there and exploring, we wouldn’t blame you! After our night in Mostar, we returned to Dubrovnik and stayed at an awesome Airbnb located just outside of Old Town with a spectacular view from the shared patio. The room was basic, but the location and view could not be beat. This is a place we’d stay at again. View from our Airbnb in Dubrovnik! Banje Beach – Just looking at photos of Dubrovnik had us wanting to go to the beach, and Banje Beach is the closest beach to Dubrovnik. It’s located just outside of Old Towns—a 5 minute walk—and is free to enter. The water is nice and cool, especially on a hot summer day, but the beach is a little rocky. If you’re looking for a smooth, sandy beach, you’ll have better luck venturing further outside of Dubrovnik. Rent a Boat – If you’re looking to get out of Dubrovnik, rent a boat. We rented our’s through Gari Transfer and has a great experience. There’s no need to have a boating license as long as the boat is under a certain horsepower. It’s really easy to do, and we made our reservation right through their website. You can take the boat basically wherever you want too. 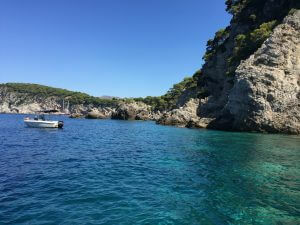 We went to the different islands around Dubrovnik: Koločep (Donje Čelo, Blue Cave) and Lopud (Sunj Beach). If you don’t feel comfortable renting a boat, you could also rent kayaks, jet ski’s, or stand-up paddle boards. 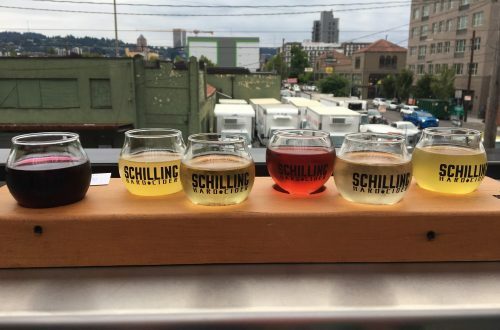 Revelin Culture Club – If you’re looking for a place to go out, head to Revelin Culture Club. It’s a little pricey to get in, and there can be a line. We recommend walking by there early and grabbing a flyer. We did this and got free entrance before 11:00 p.m. While we were some of the first people there at 11, it saved us a bit of money. The club was really cool poas it’s built right in the wall of the Old Town. Buza Bar – Another cool bar is Buza Bar. It’s sort of hidden as it’s built right on a cliff between the Old Town wall and the Adriatic Sea. The bar is pretty busy because not only is it a good view, but you can also jump from the cliffs into the sea. We didn’t jump, but it was fun watching all the other people jumping! Pizzeria Mirakul – When we first arrived in Dubrovnik, we were very hungry, and this was the place that we landed on. Given its name—Pizzeria Mirakul—we decided to order pizza. 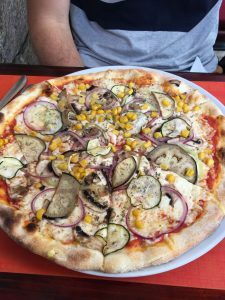 The pizza itself was pretty good and relatively cheap, but we would probably try to check out a different place next time we travel to Dubrovnik. Poklisar Restoran – This is a restaurant near the port in Dubrovnik. It is a little fancier and more expensive than some other places. We went here specifically for the Crni Rižo, (a black risotto) because it’s a must-try Croatian dish. 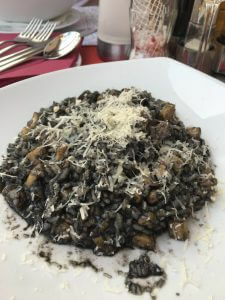 The risotto is dyed from squid ink and then it is covered in fresh cheese. We were not disappointed. In fact, this was one of our favorite meals we ate during our six weeks in Europe! Börek Pastry Stands – Böreks are a delicious filled, baked pastry. They are very popular throughout Southeastern Europe. Böreks can have a variety of fillings including sweet and savory options. Our personal favorites were the cheese and spinach filled ones. Barba – Barba is a smaller restaurant located up some steps from the main street Prijeko ul. It’s an order-at-the-counter restaurant that’s known for delicious seafood. We ordered the octopus burger and fresh oysters, and would definitely order them both again. They were delicious! Cable Car Ride – We decided not to do this, but you can ride the cable car from Dubrovnik up to the top of the mountain for an amazing view of the city and the Adriatic Sea. It’s 150 kn (about $24) for the round-trip ticket. Here are the timetables and prices for the Dubrovnik cable car. Lokrum Island – Lokrum Island is only 10 minutes from Dubrovnik and is easily accessible by boat. The island is a nature reserve and is supposed to be a nice escape from the city of Dubrovnik. We didn’t do this as we opted to rent a boat (mentioned above), but it’s recommended by a lot of places under things to do in Dubrovnik. The round-trip ticket to Lokrum Island is 150 kn (about $24). Game of Thrones Tour – You’ve probably been living under a rock for the last couple years if you haven’t heard of HBO’s hit series Game of Thrones. 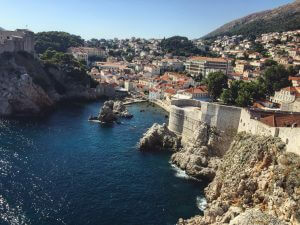 Dubrovnik was one of the primary filming locations for the series, and there are plenty of tours that will take you around to all the filming locations. We didn’t do a tour, but we saw quite a few of them. There were a lot of people on them and they sounded rather informative. 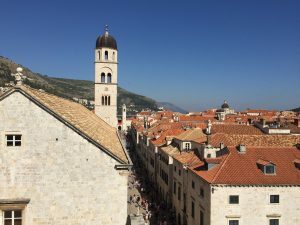 If you’re a fan of Game of Thrones, the tours in Dubrovnik are probably worth at least checking out! If you’re traveling to and from Dubrovnik by airplane, keep in mind that the airport is a good 25 minutes outside the city. There are buses, but we chose to take a taxi there and back—about $25 each way. The bus station is closer to the city center. While the walk is longer and hilly, you can take the city bus to and from the bus station and Old Town Dubrovnik. Dubrovnik is easily one of the most beautiful, scenic places we’ve ever seen. It looks like it came right out of a movie. Although it is pricey, especially compared to surrounding cities and countries of Southeastern Europe, Dubrovnik is 100% worth visiting. Have you ever been to Dubrovnik? What recommendations do you have for things to do in Dubrovnik? There are definitely a lot of tourists in Dubrovnik. We didn’t experience any hostility from locals, and doubt you would if you visit. 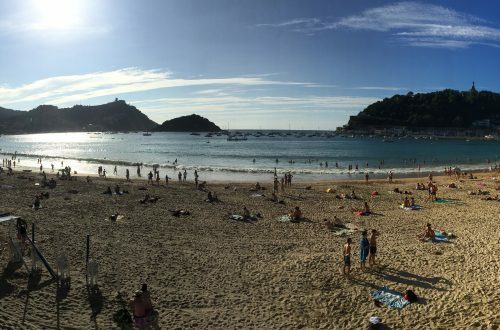 However, it’s good to be aware of cities that suffer from over-tourism and its effects on locals.